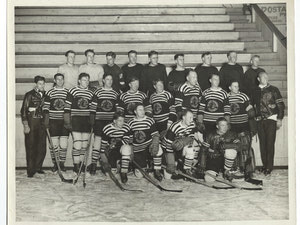 1932-33 Chicago Black Hawks original team photo 8 X 10"
Excellent condition original photo of the NHL Chicago Blackhawks. 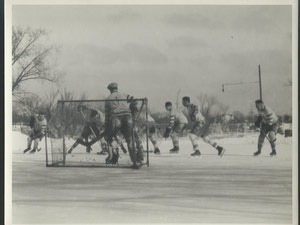 Notation on back indicates November, 1932. 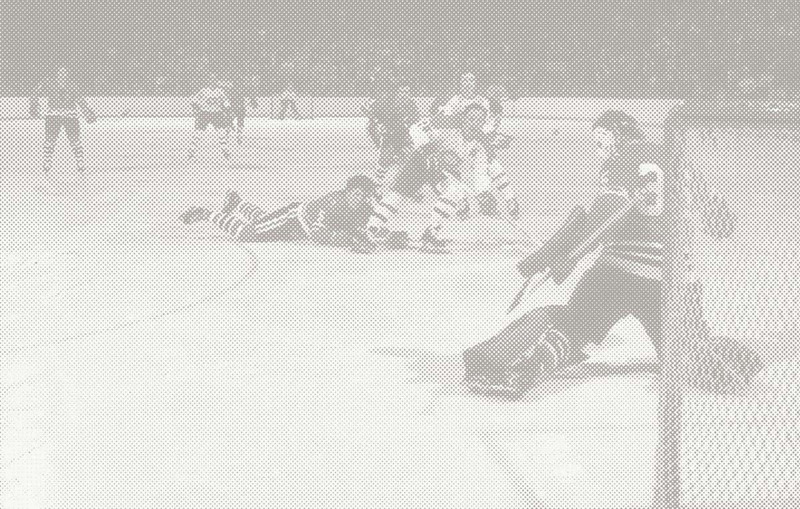 Original photo with Hall of Fame player Rusty Crawford. 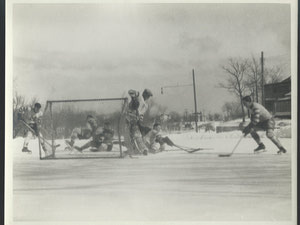 Photo taken outside the Arena in Minneapolis 1928. Fair Condition with tears, missing corner and one corner held on with tape. Incorrect notation on back "1926-27". 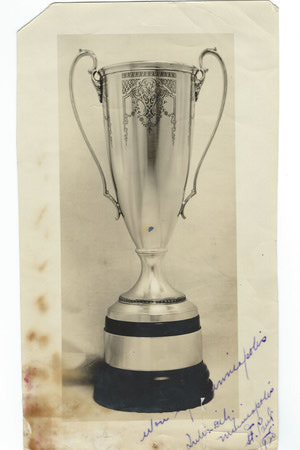 1928 F. Sinclair AHA Championship Trophy photo 10 X 6"
Very interesting photo of the F. Sinclair Trophy symbolic of hockey supremacy in the AHA (American Hockey Association). 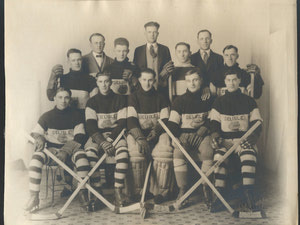 The Minneapolis Millers championship is noted for 1928 at bottom Some cropping, stains and a tear. Photo Studio stamp on back. 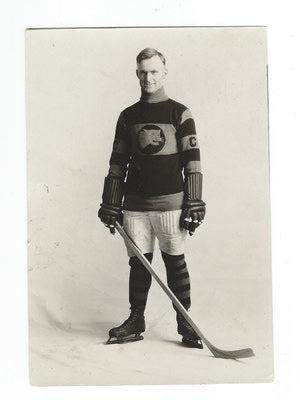 1928 NHL Detroit Cougars - Dolly Dolson Original 8 X 6 1/2"
Portrait image showcasing Goaltender Dolly Dolson in his trademark cap while wearing his NHL Detroit Cougars jersey. November 13, 1928 stamped on back. Likely cropped for wire photo purpases. 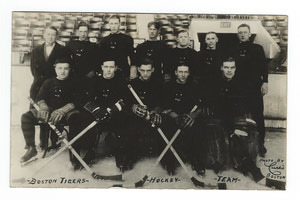 Very Good conditon original postcard of the 1926-27 CAHL Boston Tigers with Dit Clapper in his only season with team. 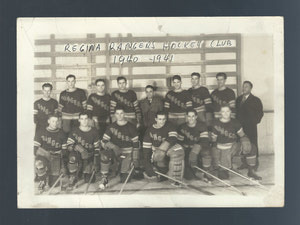 1940-41 Regina Rangers Allan Cup Champions Photo 5 X 7"
Original 5 X 7" photo featuring the 1940-41 Allan Cup Champion Regina Rangers. 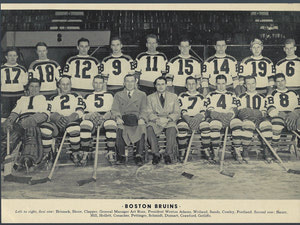 Rarely seen original team photo originally obtained through the 1939 Larus & Brothers Mail Order program through Domino and Edgeworth Tobacco. Excellent condition. 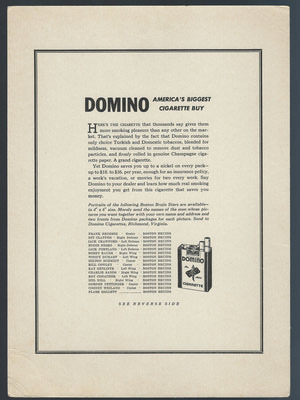 Excellent condition glossy photo from the seldom seen Larus & Bros. Company offer through the Domino and Edgeworth Tobacco products. Nice Condition original 1935 Amalgamated Press envelope designed to house the Triumph Post Card Set. 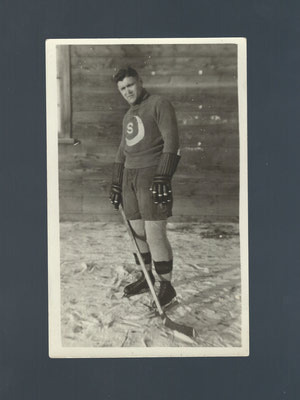 Duke (Wladislaw) Jozef Dukowski (aka: Laudes Dutkowski) original postcard from his only season with the Saskatoon - Moose Jaw Sheiks of the WCHL. 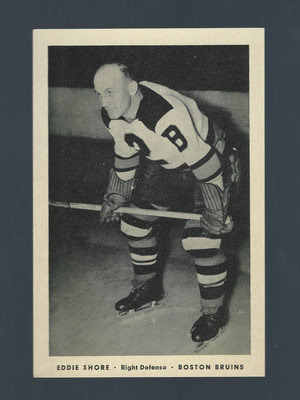 1921-22 Barney Stanley (HHOF) Calgary Tigers WCHL Original Photo 4 X 6"
Very nice condition original 4 X 6" photo of Hall of Fame player, Barney Stanley with the WCHL professional Calgary Tigers. 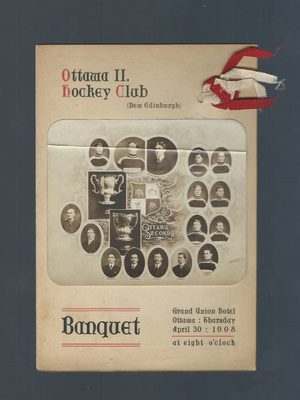 All original fold out banquet card for OCSHL Champions, Ottawa II Seconds (New Ednburgh) Hockey Club. 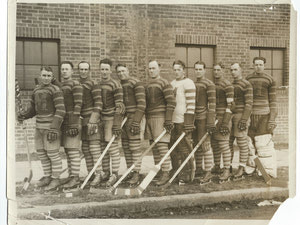 Team photo and ribbon attached to front. 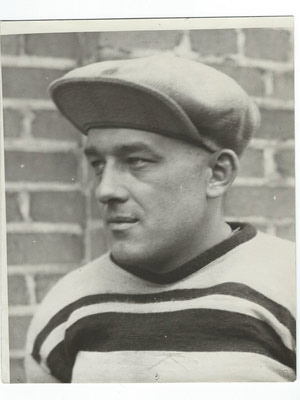 Eddie Gerard HHOF player. 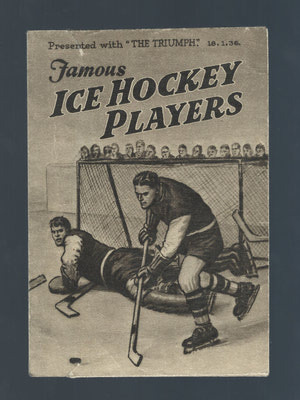 1927-28 AHA Minneapolis Millers "Tiny Thompson" Original Photo (#2) 8 X 10"
1927-28 AHA Minneapolis Millers "Tiny Thompson" Original Photo (#1) 8 X 10"
Original 8" x 10" Photo featuring Hall of Famers Tiny Thompson, Harry Cameron, Rusty Crawford and Cooney Weiland.